Parkland Lawsuits: School Shooting Victims' Families Allege Negligence The families allege the school board, sheriff's office and others in Broward County failed to prevent the 2018 attack at Marjory Stoneman Douglas High School that left 17 people dead. Attorneys representing families of those who were killed or wounded at Marjory Stoneman Douglas High School on Feb. 14, 2018, argue several organizations and individuals were responsible for the massacre. In addition to the school district and sheriff's office, other targets in the lawsuits, announced Wednesday, are Henderson Behavioral Health, which provided mental health services to confessed shooter Nikolas Cruz; former Stoneman Douglas security guard Andrew Medina, who was the first to see Cruz on campus but did not call a "code red" lockdown; and former Broward Sheriff's Office Deputy Scot Peterson, the school resource officer who hid during the shooting rather than entering the school building to confront the shooter. The attorneys said the families have been working over the 14 months since the shooting to reach a settlement — a fund that would provide millions in compensation for each family. But the lawyers say the school board has been lobbying against legislation at the state Capitol, where lawmakers are now holding their annual session. A spokeswoman for the school board refuted the assertion that the district has lobbied against the legislation creating a compensation fund for families. One of the plaintiffs is Mitchell Dworet, who said he is in a "very unique position" because one of his sons was killed and the other was injured. "My son is Nicholas Dworet. He was killed in the third room," Dworet said. "My other son is Alexander Dworet. He was in the first room. He was injured, he saw children killed and he lost his brother. This is a life sentence for me. It's every day. This is not normal. This is not right. There were failures. I want to be in court. I want to see who, what, where, how, why. 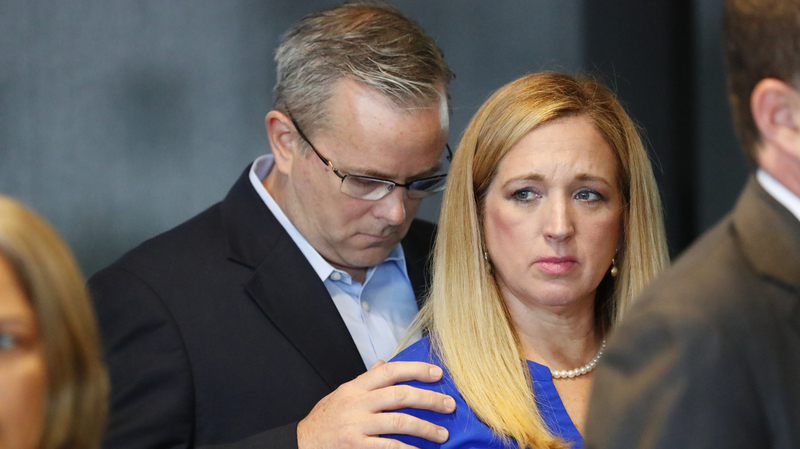 Lisa Olson — whose son, William, was shot and survived — also spoke Wednesday about how difficult it has been for her family to cope with the lingering effects of the trauma. "It's a daily struggle," she said. Referring to the survivors, she said: "They are not the people they were before Feb. 14." Another plaintiff is Lori Alhadeff, whose daughter, Alyssa, was killed. Alhadeff was elected to the Broward School Board last November. Under Florida law, the legislature must approve any local government settlements that exceed $300,000. The process of passing these bills often takes years, and many are never approved. State Sen. Lauren Book, a Broward County Democrat, filed three bills this session that would create compensation funds for families of Parkland shooting victims. "There's still three weeks left in the legislative session, and everybody knows that almost everything happens at the very last minute, on the very last night, in the very last hour of the legislative session," Kelley said. "So they still have an opportunity to do the right thing by these families ... and all these lawsuits could be dismissed." Without a settlement, the lawyers predict the lawsuits could take years to resolve, cost millions of dollars and require survivors of the shooting to provide depositions.